Clinic Synopsis: Macias will discuss how to organize, teach and perform with a fiddle group. Topics will include rehearsal techniques, music selection and booking performances. She will also discuss the logistics of recording a CD and how this group has been an effective fundraising organization. Clinician Biographical Information Anna Macias has served as the Director of Orchestras at Lake Travis High School in the Lake Travis ISD since 1996 and has served as a conductor with the Austin Youth Orchestras since 2003. Ms. Macias has served as an organizer for the Texas Music Educators Association (TMEA) High School Region Orchestra since 1999 and is currently serving as TMEA Region 26 Orchestra Division Chair. Ms. Macias is affiliated with TMEA, Texas Orchestra Directors Association (TODA), Texas Music Adjudicators Association (TMAA), and Mu Omicron. 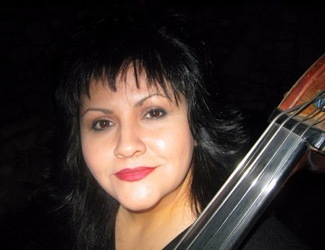 In addition to her work with public schools, Ms. Macias maintains a private double bass studio. In 1997, she attended the Texas Music Camp, hosted by Johnny Gimble, and fell in love with Texas old time fiddling and Western Swing music. In 2000, Ms. Macias formed the Lake Travis Fiddlers, a group of talented middle school and high school students who perform old time fiddle tunes and Western Swing music at various hill country functions.